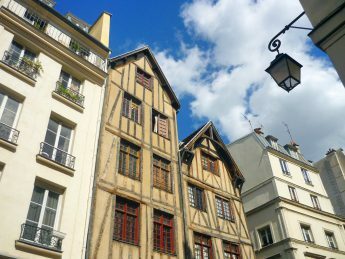 From the medieval past of Paris, only a few residential houses remain in the historic centre of Paris. I posted an article about the hidden timber house in rue de Braque. 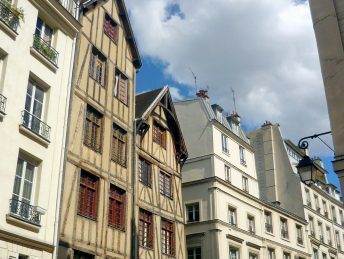 The two half-timbered houses on rue Francois Miron are visible from the street. And as always there is a little story to tell about these houses… Rendez-vous in the rue François Miron in the 4th arrondissement. 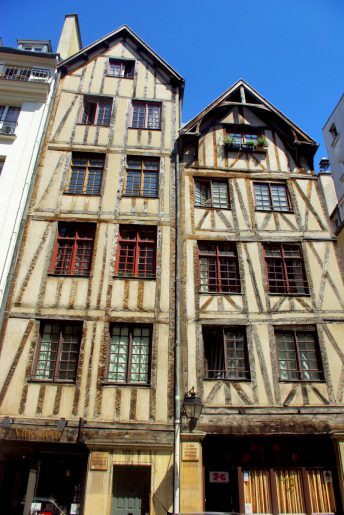 Long considered to be Paris’ oldest houses, the two half-timbered houses on rue Francois Miron date back to the beginning of the 15th century. Sources indicate that they could have been built as early as the 14th century. Number 13: the corbeled House of the Sheep (À l’enseigne du Mouton). In the Middle-Ages, houses were not identified by numbers as is done today but by shop signs informing on the merchants activities. From 1508, successive royal decrees prohibited new construction with projecting parts. They were seen as dangerous enough to fall on the head of passers-by! The gable of the Sheep House was therefore removed in the 17th century. In 1607 the appearance of the tall and narrow houses changed when the façades were covered with a mixture of plaster and lime. Many other houses in Paris were treated the same way as to reduce the risk of fire. It’s only since 1967 they have regained their former medieval charm when the plaster was removed to reveal the old timber. The gable of the Sheep House (number 11) was rebuilt. Did you know? The street where the medieval houses are located takes its name from François Miron, a popular Provost of the merchants of Paris from 1604 to 1609. 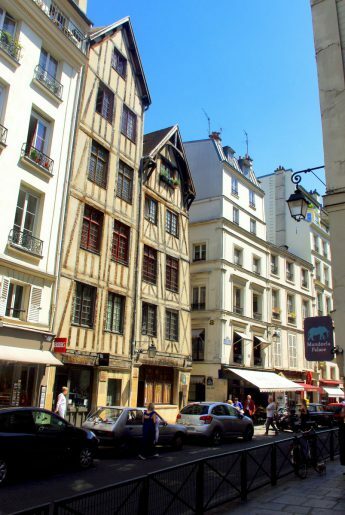 Find out more about the half-timbered houses on rue Francois Miron on the blog of my friend Sabrina Tu Paris Combien. Lastly, did you know that the French term for “half-timbered houses” is “maison à colombages” (masculine)? Many half-timbered houses can be seen across the regions of France with different styles: Normandy, Brittany, Burgundy or Alsace (read our dedicated article!). I’m so glad I discovered your blog! I’ve been to France twice. Both visits included Paris. I’m interested in the Middles Ages, so while there I visited the (few) medieval sites/buildings available. However, I was did not learn about the Billettes Cloister or the houses on Rue Francois Miron until reading your blog this morning. I will definitely look them up on my next visit.